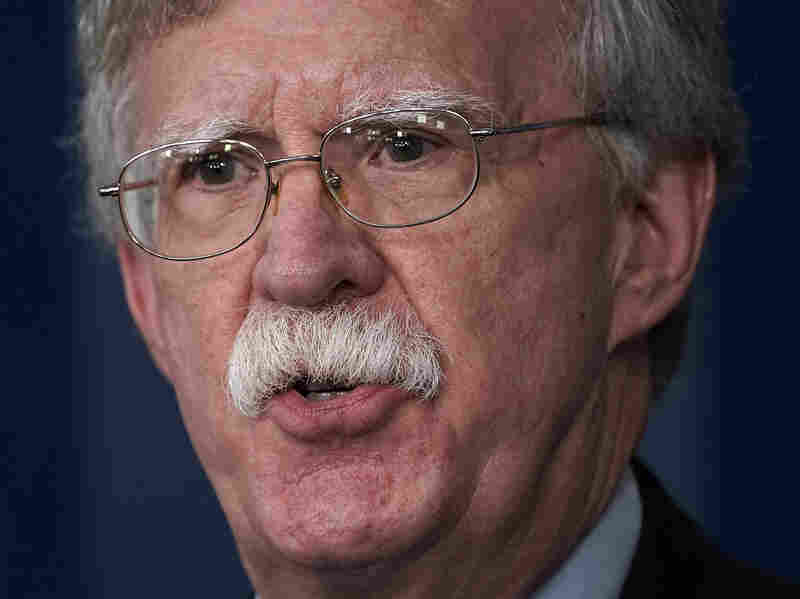 NPR News Interviews National Security Advisor John Bolton National Security Advisor John Bolton spoke to NPR's Steve Inskeep in a broad ranging conversation about China and national security, including a possible second summit with North Korea. National Security Adviser John Bolton speaks during a White House news briefing at the James Brady Press Briefing Room of the White House October 3 in Washington, DC. Thursday, December 6; Washington, D.C. - National Security Advisor John Bolton spoke to NPR's Steve Inskeep in a broad ranging conversation about China and national security, including a possible second summit with North Korea. Portions of the interview will air on today's All Things Considered and Friday's Morning Edition. Excerpts of the interview are available below and can be cited with attribution to NPR. A full transcript will be made available after the interview has aired. Audio clips are available upon request, please email mediarelations@npr.org. "I'd rather not get into the specifics of law enforcement matters. But we've had enormous concerns for years about the – in this country – about the practice of Chinese firms to use stolen American intellectual property, to engage in forced technology transfers, and to be used as arms of the Chinese governments objectives in terms of information technology in particular. So not respecting this particular arrest, but Huawei is one company we've been concerned about. There are others as well. I think this is going to be a major subject of the negotiations that President Trump and President Xi Jinping agreed to in Buenos Aires." Bolton went on to describe frustrations about Chinese companies like ZTE doing business with Iran in violation of U.S. sanctions – sanctions Bolton described as one of President Trump's signature policies. INSKEEP: "Is this [arrest] about Iran?" BOLTON: [...] I was referring to the broader subject of our concerns with Chinese companies. As I said, I don't think it's appropriate to get into the specifics of a particular law enforcement." BOLTON: "I don't know the answer to that. I knew in advance. This is something that we get from the Justice Department. And these kinds of things happen with some frequency. We certainly don't inform the President on every one of them. INSKEEP: "Okay so you knew at that dinner over the weekend with China's president that this arrest was taking place." BOLTON: "Well you know there are a lot of things that are pending at any given time. You don't know exactly what's going to happen in terms of a particular law enforcement action. That depends on a lot of other circumstances." "I've heard going back years, 'Just let the Chinese economy grow a little bit and you'll see democracy spread all through the country. You can't have economic openness without having political openness. And on the basis of empirical reality, we know today that connection is far from certain." "Well, I think what we're gonna do, beginning in the next 90 days, as President Trump and President Xi agreed, is see if we can address some of these structural issues in China's economy. I think that would have [a] potentially profound impact on their political structure as well. That's not what we're aiming at but if the theory is correct, we'll see what flows from it. The main thing is to protect American jobs and American companies from the unfair treatment they've received at the hands of the Chinese government over a long period of time." "Well I think President Trump's trying to give North Koreans a chance to live up to the commitments they've made at the Singapore Summit. He's held the door open for them, they need to walk through it. And this is one more chance for Kim Jong-un who is the only decision maker that matters in the North Korean system to deliver on what he said in Singapore and that's possible I think some time after the first of the year." "Well, I don't think the president views [it] as rewarding him. The issue is not simply what North Korea says. We've heard for decades that they're willing to give up their nuclear program. What we need to see is performance."